Close your eyes for a moment and picture your dream home. Is it eclectic? Do you have a minimalist kitchen? Is there a lot of natural light? Are your walls decorated with vintage maps from around the world? How earth-conscious is your home? We all have ideas for how we can personalize our living spaces. Yet, as a person living alone, finding time to make these changes can be challenging, especially when we are also out there in the dating world. Sometimes just getting your laundry washed, folded, and put away is a major accomplishment. And if you’ve invited someone over for a date and have to carve out time to get the house ready? That is no small feat! 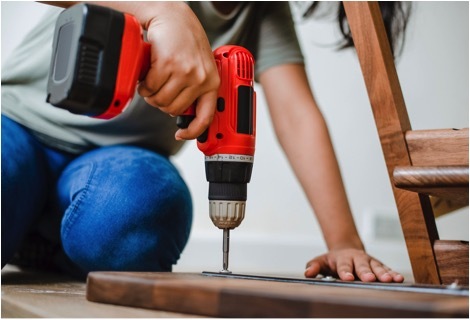 Fortunately, we have a few tips to share that can make interior decorating and tackling home improvements a little easier. There’s a tendency to assume that home projects are always going to be time-consuming, stressful, and expensive. This isn’t the case. You don’t have to break the bank keeping things fresh, up-to-date, and most importantly, safe. There are many ways to update your home on a budget. First, let’s take a look at interior design. Figure out what you like, and then make a plan. Break it down into a series of steps and conquer a little at a time. Occasionally, small changes can make a huge difference. Instead of buying a new bedframe, perhaps you could take an afternoon to craft a new headboard. Why buy new kitchen cabinets if you can transform the room simply by painting them a new color? There’s no reason to put the rest of your life on hold during the process of turning your living space into a place that truly feels like it’s yours. Home improvements also tend to get a bad rap. Decorating a home has a fun element to it. On the other hand, having to update wiring or get your HVAC system fixed can be daunting. One way to give yourself a little peace of mind is to invest in some insurance. Another good idea is to look at home improvements as a way of adding value to your place. If you don’t have the funds to get new siding, maybe just get out into your yard and do a little landscaping. Curb appeal can potentially increase a home’s worth by 3 to 5 percent. The key to keeping your house up to date is to enjoy the process and keep from becoming overwhelmed. You have enough to do as a single person without becoming completely burdened by thinking you need to accomplish everything in a day. Ask for help, do the research, and turn your big projects into smaller, easier segments. Your home is supposed to be where you can relax and kick up your feet, so don’t drive yourself crazy trying to conquer everything on your own. Who knows? Perhaps after having a date over for dinner one night, you could wind up shopping at flea markets a few weeks later, looking for quirky doorknobs or antique furniture together.